Learn more and unlock the lessons below now! Welcome to the first level of the Idea Maker Course! And congratulations! So many of us bounce ideas around in our heads without ever taking the time to get them down onto paper, even in the fundamental ways we’re going to do here. And so many others inadvertently skip the simple up-front steps you’re going to learn here for making your ideas stronger and saving yourself from wasting time and money on the wrong things. This level is the first step in a broader deliberate and iterative design thinking process that we’re going to explore together over the next seven levels. You’re going to take an idea from a concept in your mind and get it down onto the back of the proverbial Idea Napkin. You’ll lay the foundation for designing and validating the higher potential versions of all of your ideas. And you’ll begin building the skills to grow those into amazing projects, products, and businesses that are both highly impactful in the world around you and imminently feasible for you and the teams you’ll start to attract. The Idea Napkin is the first framework we’re going to tackle in this course, so in the following we share a story that puts into context and explains how frameworks like this can lead to leaps in understanding. 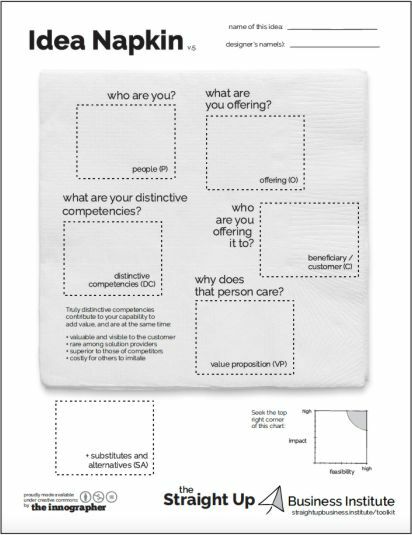 Even something as simple as the questions on the back of a napkin can become a powerful tool for people designing change. This is the version of the Idea Napkin we want you to use. The task is to simplify and communicate your idea in this format so you can begin the design process and start sharing the idea with others. You can print off the PDF version and do it with a pen and some Post-It Notes. We like doing this over a cup of coffee or beer. Or you can use the Google Docs version which we like too because it allows us to easily collaborate on and share our ideas with others. Either way, clear your mind, put everything distracting away, and give yourself the gift of focusing on the fundamentals of what your idea is really all about. Click through the lessons below! Click through the lessons below when you’re ready to begin! Who are you offering it to? Why does that person care? What are your distinctive competencies? How’s your customer's substitutes and alternative situation looking? Wrapping things up and bringing up your game!